Every week our office receives requests for financial support from missionaries all over the world. All of their stories are compelling and it is sometimes difficult to know to whom we should respond given the limitations on the way we are allowed to directly distribute funds. The two principal ways in which we are able to provide financial assistance to missionaries are Mass stipends given by our donors and our Missionary Cooperative Program. In considering these multiple requests we have tried in the last year to pay particular attention to those missionary dioceses and groups that have never been recipients of our generosity. 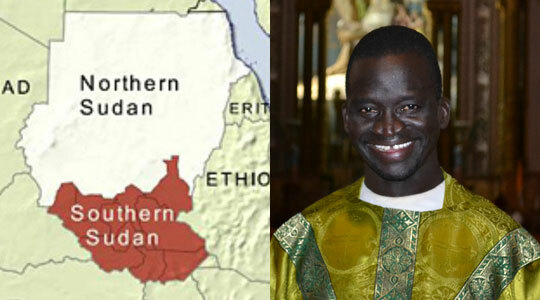 Recently we were contacted by Father Peter Loro Bambu, a priest of the Archdiocese of Juba. His story is one of the most compelling I have encountered because he ministers in Southern Sudan, a country that has long been torn by civil war. The Archdiocese of Juba numbers within its borders millions of refugees who live in substandard conditions and are served by priests who are as poor as the people they serve. The people look to their priests for everything—food, clothing, money, and educational expenses for their children. Although the priests do the best they can, very often they have little that they can give them except for their faith and the consolations of the sacraments. We hear often in our own country about the “shortage of priests.” Father Peter describes a situation in which one parish is made up of as many as 103 “chapels” or outstations—comprising an area roughly the size of the state of Rhode Island—and served by two priests who travel to these chapels the best way they can, very often by bicycle or motorcycle. Father Peter says that he was accustomed to navigating the Nile River by canoe to get from place to place in his last parish assignment. This year we welcome Father Peter and many other missionaries to Boston to participate in the Missionary Cooperative Program. We are confident that the people of our parishes will be as generous to these servants of the Gospel as they have been to past missionary visitors. As we launch this year’s Missionary Cooperative Program, we thank God for your generosity and pray for His generosity to you in return. The two pillars of the Holy Childhood Association, the Church’s mission society for children, are prayer and sacrifice. We ask children to pray a Hail Mary every day and make a regular offering for their brothers and sisters in Christ who live in the missions and cannot depend upon the material or spiritual blessings that we do. Most students seem surprised when I tell them that their prayers are just as important to the work of missionaries as their sacrifices. In the schools and parishes that I visit, even the youngest child has a very firm idea about the mechanics of prayer. They walk me through the steps of talking to their friend, Jesus. First, they make the Sign of the Cross, and then they may recite an Our Father, Hail Mary or Glory Be. Next, they start to put together their list of needs: “Please take care of my Grandma who is sick…please help me on my test today…please watch over my family…” When pressed for more details, most children will add (some with a sheepish grin) that they do indeed remember to tell God that they love Him and are thankful for the many things He has given to them. This, of course, is followed by more lists! Finally, they end with another Sign of the Cross and declare themselves finished. Quite often, I have to point out to them that they are not quite done. They have missed a vital part of prayer. They raise their hands and try to guess – did we not say thank you? Please? I love you? What didn’t we say to our Friend in this conversation? The room fell silent. Her teacher smiled. We took the time to talk about what God might say to each of us and that everyone’s message from God is different because we are all unique creations with our own gifts. We talked about the children in the missions who have just as many gifts as the children in Chelsea but need the help of the local students to develop them to God’s glory. St. Rose’s students learned that without missionaries in place to teach mission children, they may never learn many things in life, most importantly to be still and listen when they pray. Because, like us, God always has something to say! 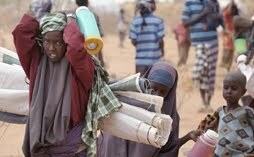 January 15, 2012 was celebrated by the Universal Church as the World Day for Migrants and Refugees. On that occasion, Pope Benedict XVI reminded all of us that, although these men, women, and children are the recipients of charitable outreach, they are also called to be missionaries as they find their way to new and stable communities. In his Angelus talk on the fifteenth, the Holy Father referred to the Scripture readings for that day. The theme of these readings was “vocation” in the broad sense of the term. Samuel, in the Old Testament reading for the liturgy, heard and answered the call of God. Likewise, Peter, Andrew, James and John willingly left all to follow Jesus and preach the Good News of the Kingdom of God. All of this serves as a challenge to “cradle Catholics” as they welcome people from different cultures and races into our neighborhoods, churches, civic organizations and schools. We, who may never be required to leave home to engage in missionary activity, need to remember that on the day of our baptism we were commissioned as missionaries who are called to bring the Gospel message even to the small, secure part of the world in which we live. Ours is both a local and a global task. Our Holy Father concludes, Christian communities are to pay special attention to migrant workers and their families by accompanying them with prayer, solidarity and Christian charity, by enhancing what is reciprocally enriching, as well as by fostering new political, economic, and social planning that promotes respect for the dignity of every human person, the safeguarding of the family, access to dignified housing, to work and to welfare. As we “go forth and teach all nations,” we thank God for the gift of our own faith and pledge to share it with others to the best of our ability. For more information about the work of spreading the Gospel message, see our website, www.propfaithboston.org.